“This is Dr. Frasier Crane; I’m listening.” If you are a ’90s television sitcom fan, you might remember this call-in radio show opener by a fictional psychologist on the TV show Frasier. Whether you’re calling into an advice hotline or have some thoughts about how to improve processes at the office, everyone wants to be heard. In fact, one of our Core Values at Blinds.com is ‘Be Yourself and Speak Up”. We want everyone to be engaged and to know that their voice has an important role in the future of the company. I recall a time when an associate told me about an entire pay-per-click bidding campaign that mysteriously disappeared, causing a drop in visitors and revenue. By this associate speaking up, we discovered how to prevent it from happening, our revenue instantly went up, and my trust in that associate increased. Now I don’t have to second guess her. So, why don’t they come talk to you? Fear of retaliation or looking stupid: Employees may harbor a strong fear of retaliation due to a lack of trust, or feel nervous about looking stupid if they don’t have all of the right information. Appearance of challenging authority: Their upbringing may have taught them to never question authority, leading them to believe it is always good politics to agree with the boss. Previous bad experiences. A previous poor supervisor, or someone who took feedback but never acted on it, may cause them to believe it’s not worth the effort. Unskilled with practical candor: Employees unfamiliar with the practice of giving feedback in a trustworthy but honest manner may feel that their comments are rude or unwelcome. Your door isn’t really open: Asking people to give you feedback, and being available to take it are not the same. Make sure that when you say your door is open, you really mean it! Even better, don’t mention that “your door is open”, but instead that you’ll come to them! 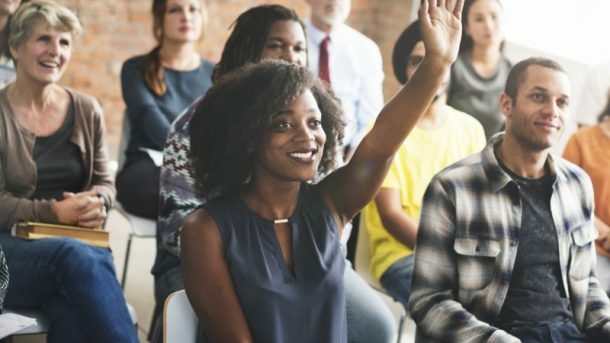 Whatever the case may be, it’s important to train your leaders to be exceptional listeners and to model these behaviors yourself to encourage employees to speak their minds. Tell people you want feedback and ask for it frequently. Make public examples of good cases to honor those that speak up, so that others understand that the trust is there should they feel the need to come to you. Practice the basics of active listening, including repeating parts of the conversation back to them. Don’t just wait for your turn to speak. Put your cell phone down for the conversation and close your laptop. Reciprocate in an equally candid way. Explain the merits of the idea and ask questions about things that may cause barriers, rather than being dismissive. Respond quickly even if you need time to think about it. Be available. If you’re always out of the office, in meetings, or in a closed room, the feedback will not reach you. Everyone should be encouraged to contact you by whatever means necessary, whether it’s email, phone, or in-person. When growing a culture of Speaking Up, be sure to let your team know that bringing up problems is a sign of strength, while hiding problems is a sign of weakness. The more I listen, the more I am able to identify who can be trusted to connect with me and help our business when things aren’t going well. Or, even better, when they’ve got the next “Big Thing” to share with me. I can’t wait to hear it!